Creating Somewhere Under The Sun: Thank You for a Teacher! Thank You for a Teacher! I am back and was happy I found the chance to make the second card I needed for my son's other teacher! I used inspiration from a sketch! It's always fun to have a jumping point! Sweet Sunday Sketch - I rotated the image. I am also joining in the fun at Hiding in my Craft Room - Freestyle, D. L. Art - May Linky. Using stamp and tag die from My Creative Time, papers from my scrap pile, and my Cricut Preserves cartridge. The Gold Star I've had, and I used an ABC embossing folder on the yellow background cardstock for the apple to tie the school theme together. I hope you have a Fantastic Friday and a wonderful weekend ahead! Love love love love this! LOVING that apple!!!!!!!!!!!!!!!!!!!!!!!! Pretty! I know, once my boys went to middle school, I was a little sad about not getting to create cards and end of the year gift baskets. ((Sigh)) I miss getting my Pinterest on!! 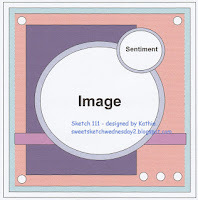 Thanks for sharing your work with us over on the Sweet Sketch Wednesday 2 blog. Such a pretty card my friend! Your son's teacher will absolutely love it!! What a cute card for your son's teacher!! Love the gingham apple, star and ribbon!! I'm sure your son's teacher will appreciate it!! That little gingham apple is adorable! Sweet card Tammy!